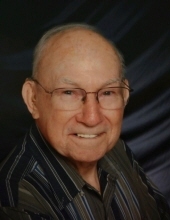 Walter P. Gutowski, 91, De Pere, formerly of Crooked Lake, passed away early Saturday morning, January 26, 2019. He was born December 19, 1927 to the late Alexander and Frances Gutowski. On June 5, 1948 he married Mae Servais. Walter retired from Milprint, after many years of service to the company. He loved the outdoors, and had served as a Volunteer Firefighter for Crooked Lake. He is survived by his wife Mae, their children; Christine (James) Price, Gerald (Charlotte) Gutowski, Jill (Russell) Hetzel, Lynn (Kirk) Matzke, and Todd (Deanna) Gutowski. Walter is further survived by his grandchildren; Troy (Laurie), Eric (Darlene), Carrie, Brock, Nikolas, Elizabeth, Nicole, Tyler (Rachel), Nicole (Josh), 7 great grandchildren, his brother Richard Gutowski, brother in law; Edward (Joan) Servais, and sister in law Louise DeWitt. Walter was preceded in death by 6 brothers and 4 sisters. Friends may call after 9:00AM Tuesday January 29, 2019 at Our Lady of Lourdes Catholic Church, De Pere, until the Mass of Christian Burial at 10:30AM with Fr. Benny Jacob O.Praem. and Deacon Mike Vander Bloomen officiating. Please go to www.ryanfh.com to send online condolences to the family. Ryan Funeral Home, De Pere is assisting the family. Very special thanks to nurses and staff at Unity Hospice for all of the care and concern shown to Walter and his family. To send flowers or a remembrance gift to the family of Walter P. Gutowski, please visit our Tribute Store. "Email Address" would like to share the life celebration of Walter P. Gutowski. Click on the "link" to go to share a favorite memory or leave a condolence message for the family.